2014 Ducati 1199 Panigale R. Picture credits - Ducati. Submit more pictures. The 1199 Panigale sets a new and extreme standard of reference in the world of superport bikes. The project that brought the 1199 Panigale into being based itself on two seemingly impossible objectives, which have been brilliantly achieved: a 10 kg reduction in weight and a 25 HP increase in power. Its arrival is a milestone in the glorious history of the Ducati Superbike. Fuel system: Injection. Mitsubishi electronic fuel injection system. Twin injectors per cylinder. Full ride-by-wire elliptical throttle bodies. Driveline: Chain 525; Front sprocket 15; Rear sprocket 39. Primary drive: Straight cut gears, Ratio 1.77. Front brakes: Double disc. ABS. Floating discs. Radially mounted. Instruments: Digital unit with TFT colour display rev counter, speed, gear selected, odometer, etc. 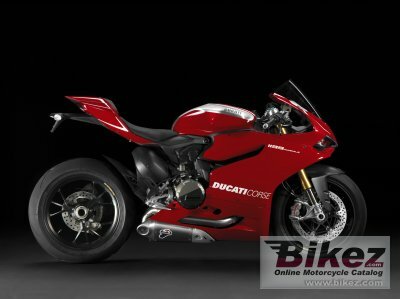 Ask questions Join the 14 Ducati 1199 Panigale R discussion group or the general Ducati discussion group.